An official in charge of women's affairs and an Afghan provincial police chief were killed in separate attacks on Monday, officials say. Najia Sidiqi, acting head of the women's affairs department for Laghman province, was shot on her way to work. Gen Mohammad Musa Rasuli, Nimroz's police chief, was on his way home from Herat province when his vehicle struck a roadside bomb, police said. Last week, Afghanistan's spy chief was wounded in a Taliban suicide bombing. Asadullah Khalid was attacked in Kabul by a man who posed as a peace envoy, in what correspondents say was a blow to peace efforts. Najia Sidiqi was shot and killed by two unidentified gunmen while on her way to work on a motorised rickshaw, the AFP news agency reports. "We have launched an investigation and we have sealed off the area where the attack took place and we will very soon capture the attackers," Laghman police chief Ahmad Sherzad told AFP. Ms Sidiqi took over the Laghman women's affairs department from Hanifa Safi who was killed in a bomb attack in July. Ms Safi, who had been a leading advocate of fair treatment for women, died when a bomb attached to her car exploded as she left her home in Laghman province. A spokesman for the police chief of Laghman province told the BBC that the acting director did not have bodyguards with her, despite being entitled to them. Last week, a 25-year-old female health worker was assassinated in Kapisa province, which borders Laghman. 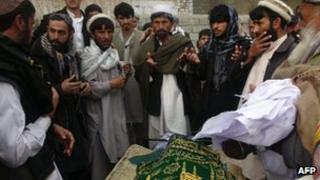 In Nimroz, officials said that Gen Rasuli died of his wounds in hospital. Three other people were also injured in the attack, reports say. It is unclear who carried out either attack. The Taliban frequently target government and provincial officials.